Brady's Super Bowl Jerseys Returned! Tom Brady's jerseys are back in his care after they were stolen in the revelry following the New England Patriots' last two Super Bowl wins. 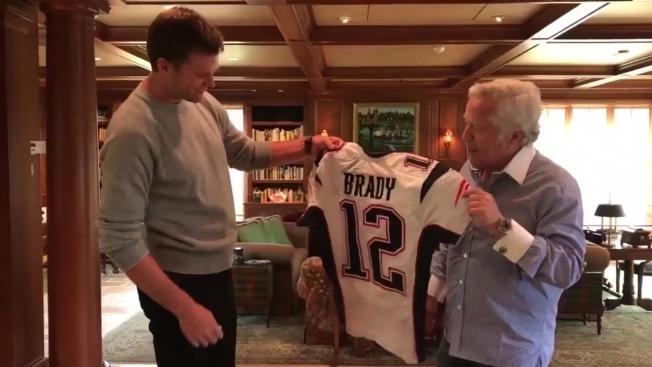 Patriots owner Robert Kraft presented Brady the Super Bowl XLIX and LI jerseys the star quarterback wore during the winning games, but were subsequently stolen from the Patriots locker room. "Look at these grass stains," Kraft says as he presents the jerseys to Brady. The jerseys were tracked down in Mexico by Houston police and FBI agents, and a Mexican journalist is suspected of stealing them.